For the best in commercial fire and security, contact Diamond Electronics, Inc. today. Diamond’s residential division will give you the utmost security protection for your home as well. Diamond is a NC Hub Certified & City of Charlotte MBE Vendor. 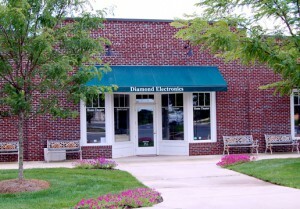 Diamond is a family owned & operated business located in Locust, NC. Diamond Electronics was established in 1996, by it’s original owner, Richard Butler. Today, Diamond’s team is led by Teresa Butler (Owner) and Josh Cole (Operations Manager; Nicet Fire Alarms #66388). Diamond has a solid reputation in the Charlotte, NC fire & security industry. Our customers are our top priority. All technicians are fully trained on the equipment we install. From large commercial projects to small residential installs, we do it all. No job is too large or too small for us to handle. Diamond guarantees quality service from the beginning of the job to the completion of the job. We are highly recognized for our professional installations and prompt responses to service issues. Diamond has maintained an “A” rating on Angie’s list and has been a proud recipient of the Angie’s List Super Service Award for many years. Ultimate protection is what we do best.